Today, bathrooms have become much larger than how they used to be. Homeowners want style, comfort, beauty and amenities in their bathroom. All these features are making bathrooms luxury and cozy. The bathroom countertops are one of the important parts of this bathroom decoration evolution. That is why it is important to select countertop which compliment bathroom décor and will hold up under the bathroom activities and has a price tag which fits in your budget. Bathroom countertops have to bear less abrasion than kitchen countertops. It means you can select bathroom countertops based on aesthetics rather than toughness. While looking for bathroom countertop materials take appearance, maintenance requirement and budget into your consideration. The choices in bathroom countertop material are overwhelming, but selecting the right material for your bath area is important. The popular bathroom countertop materials are marble, granite, quartz, tile and solid surface. However, marble and solid surface are most loved bathroom countertop material. Appearance is important aspect of bathroom countertop. A countertop can become one of the luxury features of your opulence bathroom design. For best appearance, you should opt for countertop color complimenting your bathtub color. However, marble countertop material is ideal choice for a bathroom when it comes to appearance. You obviously do not want to get any sort of stain on your countertop which can blemish your luxury bathroom decor. So, while selecting the bathroom countertop, opt for material which offers maximum stain resistant quality. Install a bathroom countertop which is easy to clean. A bathroom countertop should get cleaned with minimum possible efforts. The non porous materials like hard surface, laminate etc. can be cleaned easily. On the other hand, porous materials like granite, wood etc. are not easy to clean. So, avoid porous materials. If you do not pay attention, a bathroom countertop material can blow off your entire bathroom remodeling budget. You have to select a bathroom countertop material which fits into your budget specifications. Don’t worry; you can get excellent bathroom countertops in budget. Kitchen countertop plays functional as well as aesthetic role in the kitchen. The countertop material needs to be capable of enduring daily wear and tear, and still look beautiful all the time. Over time, even the strongest countertop material starts looking worn out. The scratches, burn marks, and chips not only make countertop to look bad, but also cause discomfort in kitchen. 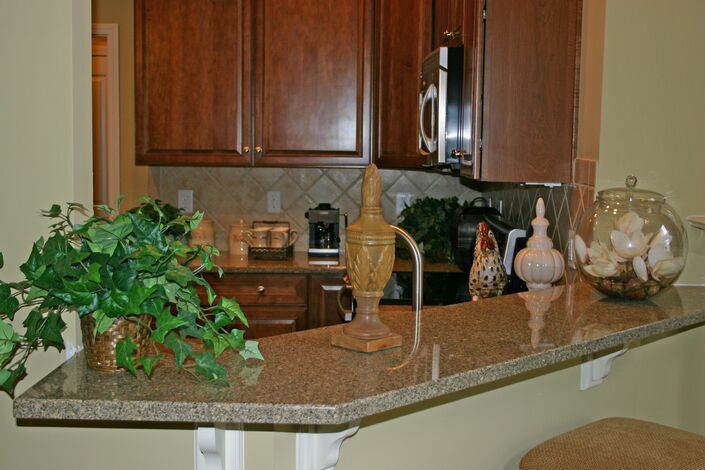 It is the time when you need to think about the kitchen countertop replacement. If you are happy with your existing countertop material, then look for kitchen countertop material that has same qualities as your existing material. On the other hand, if you are not satisfied with your existing kitchen countertop material, enlist the features that you don’t want in your new countertop. This will help you in searching countertop material which is better than your existing countertop. Kitchen countertop should complement the kitchen cabinets. Look for countertop color that looks good with the kitchen cabinets. Nowadays, kitchen countertops are available in oodles of colors and textures. You can match your countertop with the cabinet design to obtain the ultimate look. When kitchen countertop contractor install the countertop in your kitchen make sure that your plumbing remain intact. Many times plumbing system gets damaged while installing the kitchen countertop. Among all these materials, tile and faux granite countertops are easy to install. If you don’t have experience of installing countertop material, you should totally consider opting for services of professional kitchen countertop contractor. When Should You Replace Your Kitchen Countertop? We will provide to with the most competitive quote in North Carolina!